A long, summer road trip somehow isn't complete without a stop at a Dairy Queen or one of its local incarnations. So an hour or two after refueling on coffee and sandwiches in Mattoon, Ill., we availed ourselves of the ubiquitous freeway food signs and entered a Dairy Queen in the middle of farm country. As you can see below, the store had seen better days. If the half-destroyed sign wasn't an indication of neglect, note that we were visiting at the end of June. 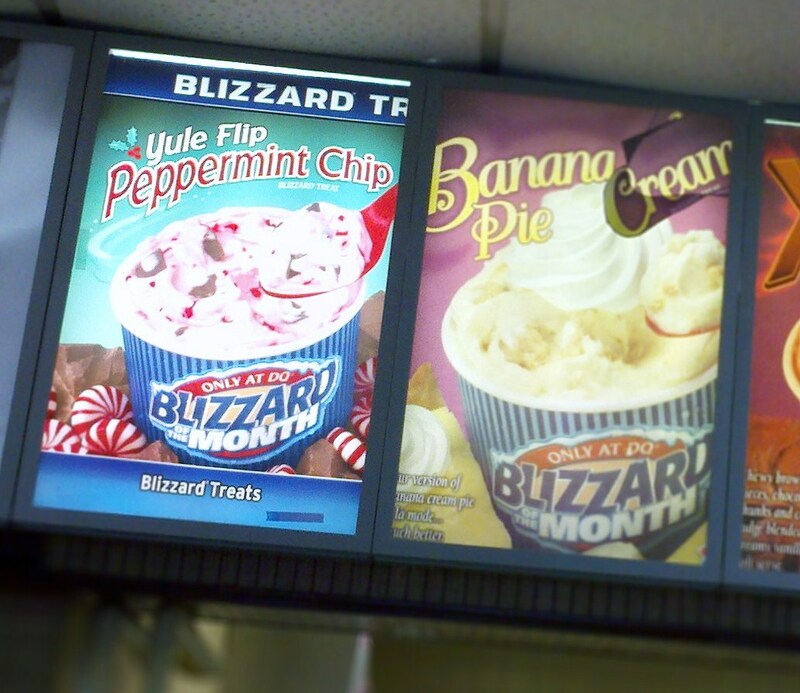 Clearly, this summer, Yule Flip for Peppermint Chip. Who says we have to wait until Christmas? However, employees did have Dairy Queen pride: When I mistakenly asked for a "flurry," the cashier informed me that they do not carry flurries, only "blizzards." Oops. One other bit of Dairy Queen fun that will probably only amuse English majors: there was a sign soliciting donations for God's Food Pantry. Now, I don't know anything about the group, and I assume that they're doing a great thing providing meals to hungry people. 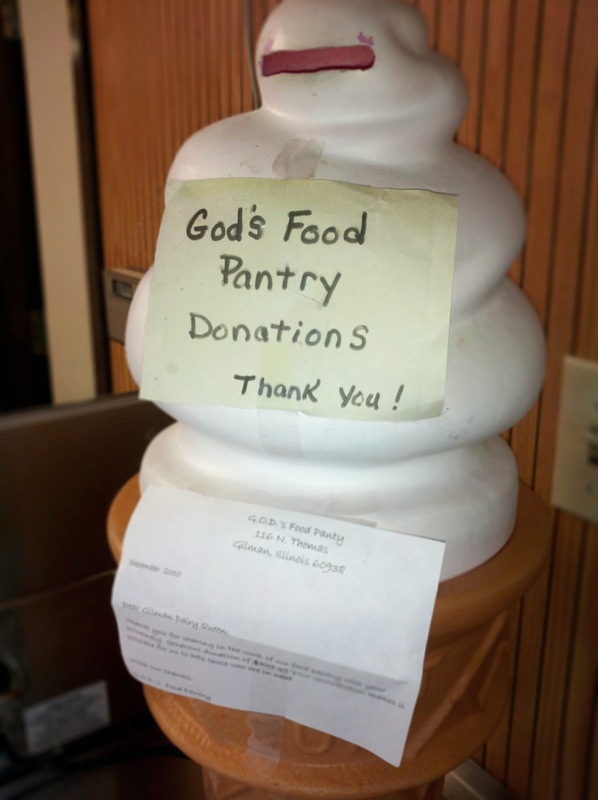 But the way the words were written on this giant ice cream cone made me think about grammar and punctuation and just how contextual the English language can be: "God's Food Pantry" could have the meaning its founders doubtless intend, a service for those who lack funds as a means of expressing God's love and grace. But "God's Food Pantry" could mean that God needs donations in order to stock his pantry with food - because he gets hungry too. (What?) Or it could mean that God eats a special kind of food (not mutually exclusive to the prior point). Obviously the latter two meanings are slightly ridiculous to Americans in 2011, so we understand that they are not the intended meaning. (Note that those interpretations would not necessarily have been ridiculous to people in other cultures and times.) But musing about how much even modern American English requires context to function makes me think about how much humility we should have when we interpret texts from other eras and languages. For example, Don Quixote is apparently filled with references to the events, places, art, and people of its day - so we as modern readers miss a large amount of what Cervantes was trying to communicate and the jokes that he was making, a problem that is only exacerbated if the reader is someone like me, who doesn't understand Spanish and has to read Cervantes in translation. A similar point can be made to literalists regarding the Bible. There are good resources in that case for getting at cultural context and the original languages, but all the resources in the world are no good if people don't use them.